Right now the air is so damp and sodden! I feel like I need gills instead of lungs to keep on living. 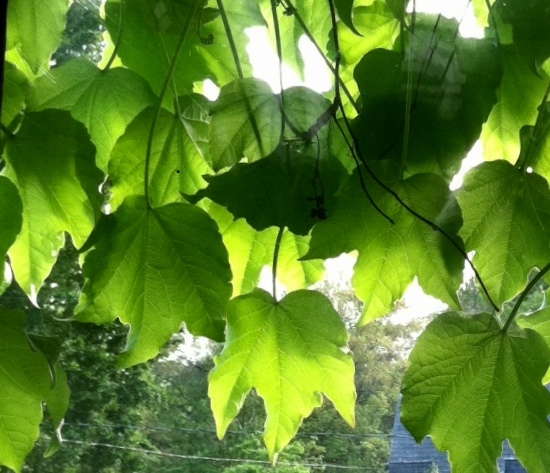 And the vegetation outside is just drenched with chlorophyll..
It’s ALL SO GREEN ! Even the inchworms are green, to say nothing of the mold growing on that one clementine that got stuck at the bottom of the fruit bowl. It looks like a fuzzy green bowling ball for Dopey and Sneezy and pals now. Can this really BE the same block? Nay, the same hemisphere, that used to look like THIS? 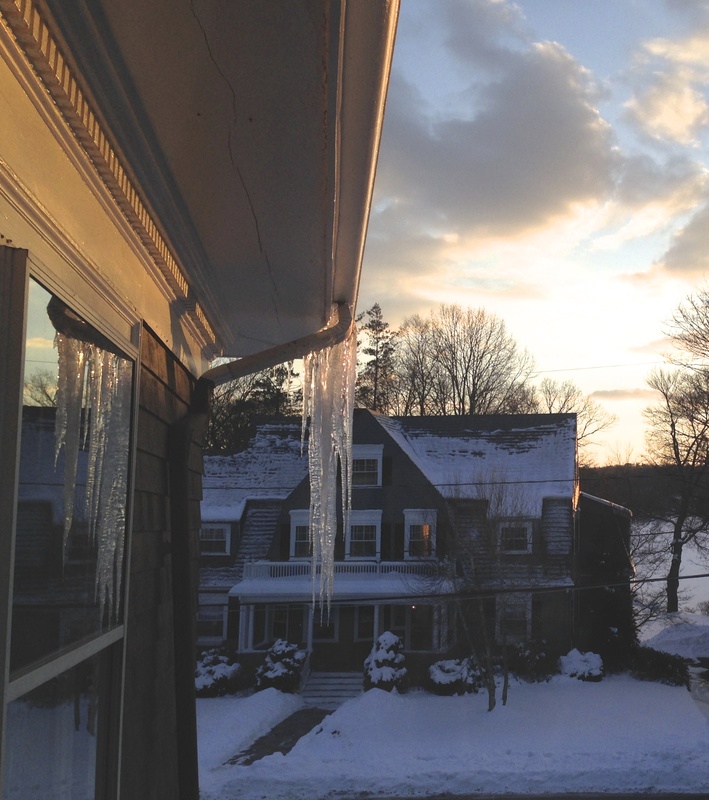 Can this be the same hemisphere where, when the sun began to set and the icicle below halted whatever dripping it had been doing OUTSIDE the house and instead got busy dripping secretly INSIDE, painting so many of our walls and windows a rich caramel brown? I mean can this above picture really be taken from the same exact spot in my house as THIS? It can be and it is…. and all I can say right now is Mama Nature she does like to keep us hoppin’! Brrr. Here in Tucson the temperature refused to drop below 100! Some beautiful imagery and inspiration from blogger Terry Marotta…. Enjoy the cool rain and summer breeze. Too soon it will be really hot and muggy. Here in MA the temp is climbing to 92 and not finished yet. T-storms to arrived between now and 8 p.m. Humidity is difficult for someone with heart failure. And the NYSE decided to take a long recess today. Enough, already! 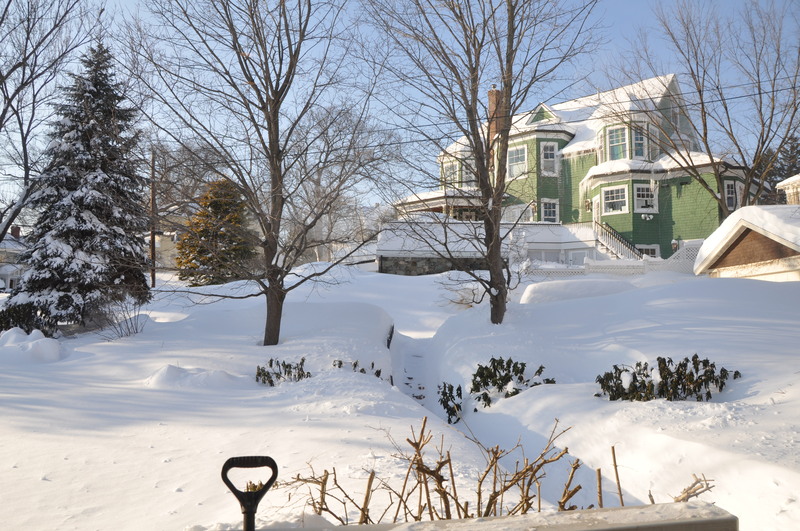 And I was surprised to hear on the national news yesterday that there is still a 12-foot pile of snow that remains in Boston. Granted it is filled with much debris that the plows collected, but it is an icy/snowy mixture nonetheless. It is predicted it will not melt until at least September. Sadly by then we will be thinking Winter thoughts since the last two Falls were cut short by snow before Thanksgiving. 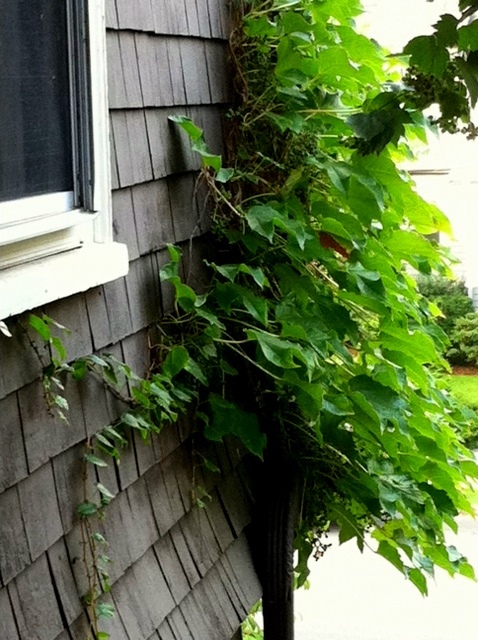 That English Ivy is an invasive exotic nuisance at ground level or climbing your walls.